For the last three months‚ Minenhle Nxele has been piecing together a massive statue of former president Nelson Mandela’s face Motorists heading towards Pietermaritzburg Airport on the outskirts of the city have been slowed down by dinosaurs towering overhead in the past few months. The metallic beasts at KZN’s own version of Jurassic Park are the creations of 23-year-old artist Minenhle Nxele‚ who operates out of Global Scrap Metal. It’s not just a life-sized T-Rex sculpture made from car parts that has kept this young artist busy. For the past three months‚ Nxele has been piecing together a massive statue of former president Nelson Mandela’s face. 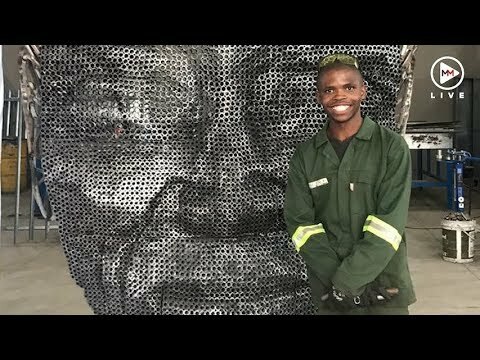 To mark the fifth anniversary of Madiba’s death‚ Nxele crafted Mandela’s Face out of 4‚000 discarded metal pipes. The sculpture is still in the workshop‚ where Nxele is applying the finishing touches. Exactly where it will go has not yet been decided. Yugan Govender‚ the owner of Global Scrap Metal‚ spotted Nxele’s talent on his CV and offered to teach him how to weld and work with metal. “We want to inspire the public to upcycle their scrap steel‚ rather than sending it to a scrapyard‚” said Govender.